Our good friend, and partner in cyclocross crime, Fabian Merino is putting together an evening of good people, food and drinks this SUNDAY, Nov 2nd. Sitka clothing store & cafe is hosting a photo exhibition and gathering after Cross on the Rock race #5: Western Speedway. 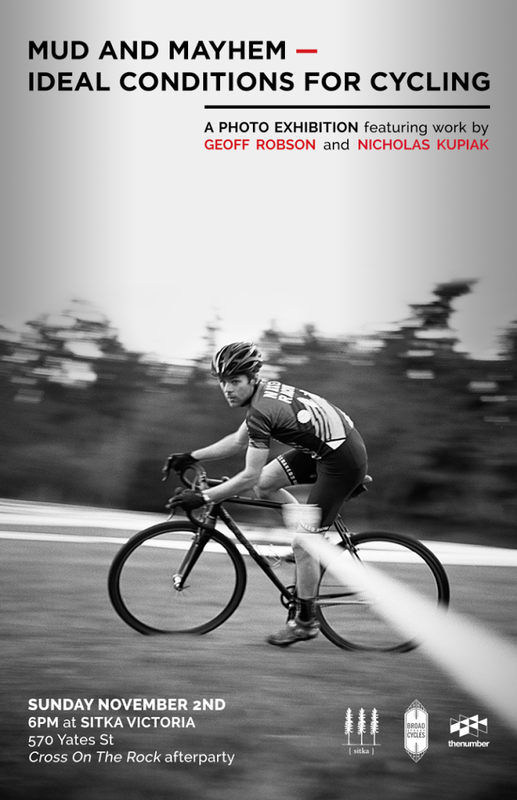 Photographers Geoff Robson & Nicholas "Ride Gradient" Kupiak will have some amazing prints featuring cross content and STUCKYLIFE riders shredding up the slop. The focus of the work is on showcasing the horrid conditions we ride our bikes in, and how despite the rain, mud, dirt & cold conditions, it is a formula for fun, sport & community. Broad Street Cycles will be putting a few center-piece CX rigs into the mix. Showcasing the technological side of poor-weather racing with some mud & mayhem-ready cyclocross bicycles. We would be psyched to have a good crew of CX-racers, enthusiasts, and good people out to this evening. Show up sometime after 6pm this Sunday, and say hello! Of Note: The event poster is another killer design by our people at The Number Creative. Many thanks for your continued creative contributions!